The Fabian Society has played a central role for more than a century in the development of political ideas and public policy on the left of centre. Analysing the key challenges facing the UK and the rest of the industrialised world in a changing society and global economy, the society’s programme aims to explore the political ideas and the policy reforms which will define progressive politics in the new century. The society is unique among think tanks in being a democratically constituted membership organisation. It is affiliated to the Labour Party but is editorially and organisationally independent. Through its publications, seminars and conferences, the society provides an arena for open-minded public debate. All Labour Prime Ministers have been members of the Fabian Society. 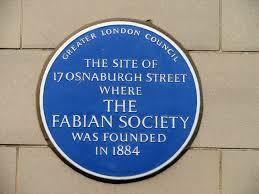 The Young Fabians are the under-31′s section of the Fabian Society. Established in 1960, they are the only think tank run by and for young people. They are affiliated to the Labour Party and have formal representation on the Young Labour National Committee. There are over 1,700 Young Fabians and all Fabian Society members under the age of 31 are automatically members of the Young Fabians. The Young Fabians develop policy ideas through seminars, conferences and pamphlets and produce a quarterly magazine, Anticipations. They seek to encourage debate and political education amongst our members and within the wider Labour movement. The Fabian Women’s Network was launched in 2005, and is run by a committee of volunteers. There are approximately 2,000 women in the Fabian Women’s Network of all ages and backgrounds. provide new ways in which women from all backgrounds and sectors can engage in topical policy debates. The Network has held a number of high profile receptions and policy discussions and regularly works with voluntary sector organisations on campaigns that affect women’s lives, including women and finance, work/life balance and family related policy. Speakers at previous events have included Cabinet Ministers, Ministers, representatives from leading charities or agencies, business, academics and media. 2011 saw the launch of Fabiana, the Fabian Women’s Network magazine. The stained glass window was designed by George Bernard Shaw in 1910 as a commemoration of the Fabian Society, and shows fellow Society members Sidney Webb and ER Pease, among others, helping to build ‘the new world’. LSE was founded in 1895 by Beatrice and Sidney Webb after a breakfast meeting with Graham Wallas and George Bernard Shaw at Borough Farm, near Milford, Surrey on 4 August 1894. The four Fabians decided to establish the School following a bequest of £20,000 by Henry Hunt Hutchinson who wished to advance the Fabians’ objectives of a fairer society. By studying the causes of poverty and analysing inequalities, the Webbs sought to promote greater equality of power, wealth and opportunity.